Everyone knows that if you want to conserve on water and energy in your bathroom habits, there are a number of ways to go about it. Invest in a water-saving showerhead to reduce your drain on that resource. Buy an eco-friendly toilet. Start purchasing recycled toilet paper. Turn the water off while you're brushing your teeth. Remember to hit the light switch at night when you leave. All of these are standard green procedures. But what if you've already devoted all your time to them? For the true eco-friendly, planet-loving tree hugger, what extra steps can be taken to cut down on your resource consumption? Try these four tips for the extra-crunchy and extra-dedicated. Although a fixture in Europe, the bidet just never made it big across the pond. Your average American can go his or her entire life without running into one of these bathroom contraptions - which is a real shame, because bidets are very good at what they do. 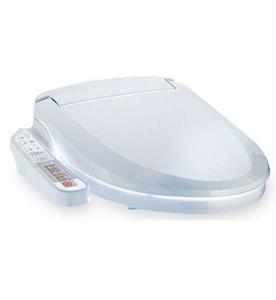 While you can invest in a full bidet, why not try out a bidet seat first? These attach to your toilet and provide the same washing function as the modern bidet does, meaning you'll feel fresher and your toilet paper consumption will dramatically decrease. Maybe you've got a teenager in the house, or perhaps you're guilty of taking long showers yourself. While luxurious, you're better off taking a piping hot soak in the tub, because after a while, your water waste exceeds a full tub! Consider bringing an egg timer into the bathroom to limit yourself in the shower and so that the minutes don't get away from you - especially if you're the type to stand there half-awake in the mornings. If the egg timer doesn't appeal to you, why not set up a CD player and limit yourself to a single five-minute song? Washing up shouldn't take much longer than this anyway. Radiant heat is an energy-efficient way to keep your rooms warm, and it's especially effective and luxurious in the bathroom. We all know the shocking chill of tile on a cold morning, but by installing radiant heat under your floors, you won't need to worry about that again. Instead of throwing money at dead trees every time you hit up the bookstore, have them sent right to your eReader device. Think about it! Not only can you read greenly on the toilet, but you can buy books and download them right into your hands. Not too shabby. Why not refigure your magazine subscriptions the same way?